I love a good cookbook, especially one unencumbered by meat. For a plant-based eater like myself, there’s nothing better than perusing through a cookbook full of gorgeous dishes that I can actually eat! This is why I’m excited to share a new cookbook with you. Yes, it’s a veggie cookbook, but one that meat eaters will enjoy, too. Why? Because it’s chock full of recipes for what might be the hardest veggies to cook…the brassicas. What are Brassica vegetables? They are cauliflower (my favorite), kale, Brussels sprouts, cabbage, broccoli, leafy greens like mustard, collard, arugula, watercress, bok choy, radish, turnip and the lesser known rutabaga, kohlrabi and mizuna, just to name a few. These are the veggies my clients tell me they don’t really know how to make taste good. I can relate…I’ve never made rutabaga or kohlrabi and don’t really know how. But now we can all get confident about cooking up the world’s healthiest vegetables! Laura Russell has written an easy to use cookbook that’s perfect for us home cooks. The recipes are smart, too. She skillfully uses cheese, dried fruit, and fat (like nuts and olives) to balance out the sometimes bitter flavor of the brassicas. 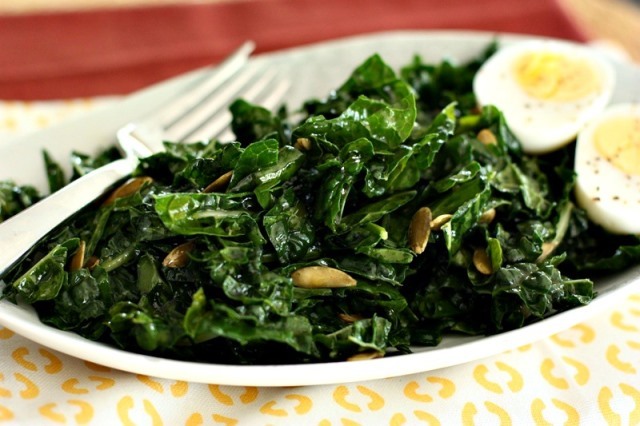 I tested this delicious and super simple smoky kale salad with egg for lunch. I love the flavor from the smoked paprika and to me, kale is quite filling. I was able to whip it up pretty easily using ingredients I had on hand. I even improvised a bit to suit my tastes (and my recent obsession with pumpkin seeds). Place kale in a salad bowl. In a small bowl, whisk together the vinegar, paprika, salt and pepper. Add the oil and whisk to combine. Pour dressing over kale and massage into leaves until kale wilts and gets soft. Add the almonds (or pumpkin seeds) and eggs and toss again. The original recipe states to crumble the eggs into the salad, but I just placed mine on top. Taste and adjust seasonings. All of her recipes are gluten free with vegan variations and tons of gorgeous pictures. Some other recipes I’m looking forward to trying are the Creamy Cauliflower Gratin, Greek Shaved Cabbage and Fennel Salad, Broccoli Rabe with Romesco Sauce,and the Spicy Soba with Wilted Watercress. Is your mouth watering yet? This giveaway ends Monday, June 16th at noon Eastern Time. Disclaimer: I received a free copy of the Brassicas Cookbook. I always struggle with making these types of veggies taste good (I’ve actually stopped trying!) Thanks for exposing us to these incredible resources! Kale because it’s hard to find here! How many servings does this make? One bunch of kale sounds like a lot for just one serving. Did you use the flat kale? I made a delicious breakfast the other day with sauteed kale and 2 eggs over easy and topped it with your Salad Swag. It was amazing. 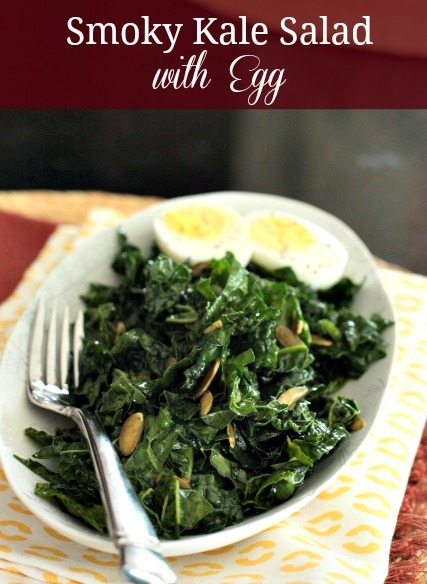 I can’t wait to try more kale and egg recipes and I love that this cookbook is GF! That is usually the hardest part for me with “vegetarian” cookbooks…so much pasta and stuff I can’t have. Always looking for new methods for cooking these veggies! I would love to win the cookbook.. thank you for the chance! I need this book! I find I fall back (far to often) on the same means of cooking these veggies. Would LOVE the fresh inspiration for some new ways to eat the brassica vegetables! This recipe looks super yummy Danielle! What are your thoughts on eating raw kale for someone with Hashimotos/hypothyroidism? Cauliflower au Gratin in this cookbook is amazing!!!! my faves are cauliflower, arugula and bok choy! thanks for the chance to win this great cookbook. I’d love a chance to win this – being a complete brassica lover. However, I usually cook mine – I think I’d steam or even throw leaves on the grill to wilt first. Yum. I love that this salad looks easy to make. 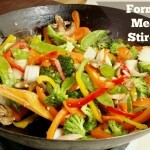 Great for a quick weeknight dinner! I can’t wait to try this kale recipe!! I love brassicas!!! Making this salad with the last of my garden kale! I’m thrilled that I won! Thank you! I made this again yesterday, and it was love at first bite. The first time I made it, I didn’t have sherry vinegar. I subbed rice wine vinegar, but do not recommend it. The salad was ho-hum. This time I used sherry vinegar and upped the paprika to 3/4 teaspoon. It was so good! I also topped it with tuna instead of hard-boiled egg. I’m starting to think of other combinations starting with that the base of smoky paprika kale. I think this is going to be in regular rotation for my lunches. Isn’t it amazing what vinegar can do? It’s an under-appreciated condiment for sure! 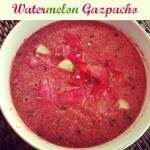 Formula Meals: Simple Stir Fry The Most Delicious Watermelon Gazpacho…EVER!